The cook at Christmas will always have a hard time, but what a little bit of planning & help can do is pre-empt the panic. 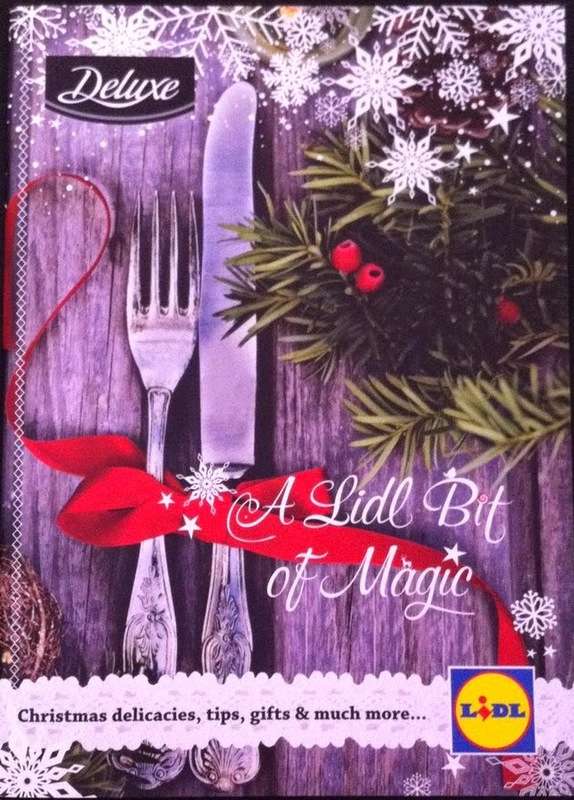 At Lidl this Christmas,you will find all the traditional favourites as well as some with a modern twist in helping you to create marvellous festive meals. 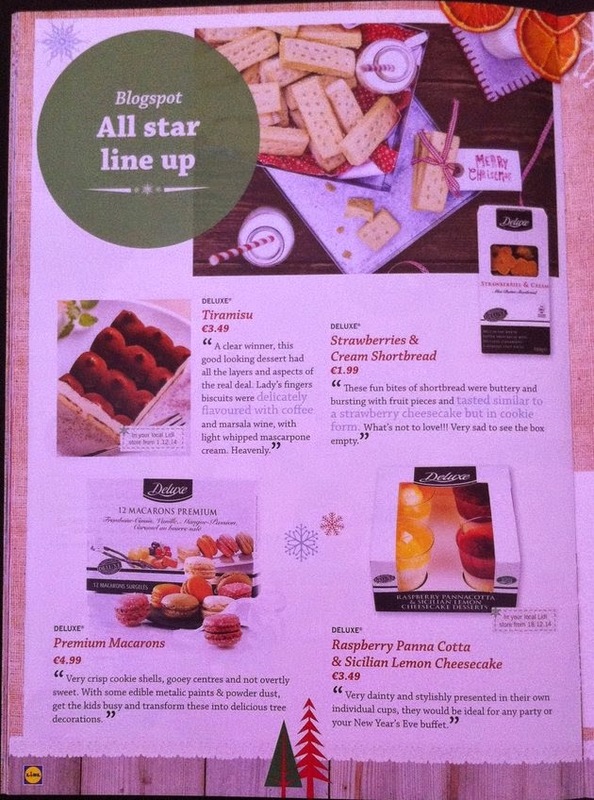 So if you want to make this Christmas one to remember, simply pay a visit to your local Lidl. Keep entertaining simple on Christmas ‘s eve and you’ll have plenty of time to relax and enjoy the festivities as well. For an elegant, easy to prepare supper, a seafood buffet will make an impressive choice. At Lidl, you will find a superb choice of top quality fish and shellfish. Mix some sweet Inismara Queen Scallops, cooked fan-tail prawns with some mixed leaves into a warm Seafood Medley. Irish Crab claws, Wafer thin slices of dry-cured salmon carpaccio and succulent sliced smoked trout. Very moist wafer thin slices of dry-cured Salmon. Silky and full of flavour, it was perfectly complimented by the saltiness of the parmesan and sweet dressing. Would make an ideal starter to your festive meal or simply as part of your Christmas’s eve buffet. A wellcome change to the traditional Smoked Salmon, this pre sliced smoked trout is a must-have for your fridge and will keep your guests coming back for more. With a subtle smokey flavour, it was delicious and melted in the mouth. Perfect for your Christmas’s Eve buffet or served on the Scottish Oatcakes with cracked black pepper oat & Roasted garlic & herb mayonnaise as hors d’oeuvres . Small portion (8 pcs),so would only be enough for 1, however they were very tasty and fresh. Would be ideal as a garnish to a smoked salmon roulade on a Christmas ‘s Eve Buffet table . Or simply tossed in butter and garlic for a very tasty starter or as an hors d’oeuvres. Again very tasty & fresh sweet crab meat but portion was on the small side. This would make an ideal starter mixed with eggs & cream and served as a Crab Creme Brulee with parmesan crisps. A very tasty medley of Salmon, Cucumber and delicately flavoured with dill. With plenty of salmon pieces & crisp diced cucumber,this handmade pate was creamy and not in the least watery.A definite must-have for your fridge. Spread on some Smoked salmon and roll into a roulade, Wrap in cling film and chill. Sliced & garnish with a wedge of lemon , it will make an ideal starter. Or simply pipe into puff pastry vol-au-vent cases, garnish with sprig of dill and serve as canapes. Full of flavour, these wafer thin air dried beef slices were delicious, with tiny gherkins and green olives, they would be perfect for your drinks party or selfishly, keep it all to yourself to nibble at while putting the finishing touches to the meal. A delicious smooth spread with a nice hint of sweetness from the ligonberries. Again deliciously smooth, while you could taste the brandy, it didn’t overpower. Coarser in texture than the other two, it was more gamey but equally delicious with a subtle earthy flavour from the Chanterelles mushrooms. They would be ideal served on crackers, or toasted sourdough for your drinks party. Should you be doing a Beef Wellington as your Christmas day main , the Pork liver & Venison pate would add wonderful depth and roundness to this dish. A must have for your store cupboard. Would come in handy in the event of unexpected guest , distant cousins & aunts. While some were better than others, they were all equally of a high standard and very tasty. While we all love cheeses , whoever has any space left to eat cheese at the Christmas table, so my advice is to reserve them for an indulgent feast on Stephen’s day while watching a movie or entertaining as they are the perfect foods to be share among guests. A Camembert style cheese, soft textured but not ripe. A nice contrast to the mushroomy earthy rind and subtle flavours of oak. Would be a perfect cheese for baking, topped with chopped dried fruits, nuts & honey and would pair well with a Sparkling wine. A buttery semi soft cheese with a mild smoky flavour which is dangerously moreish. Perfect for general nibbling at your drinks party or melted with left over turkey, cranberry relish in a sandwich. Would compliment a full bodied red wine. A soft rind and a smooth creamy interior with the texture of vanilla ice cream, this Irish Brie would be a perfect match to a well matured Port. A robust and well rounded Cheddar with a perfect balance of sharpness and lovely nutty flavour. A soft very creamy textured Irish blue and bloomy rind with a distinct earthy flavour. Would be perfect to crumble over caramelised red onions on puff pastry for tartlets. Also would make an impressive addition to any cheese board and paired with an Italian Vino Santo. Creamy and very smooth with the subtle pungent flavour of roasted garlic. Ideal as a base for hors d’oeuvres or in sandwiches for all those left over turkey & ham but it would be terrific also with roast beef. Nicely tart but it had none of the sourness or sharpness of fresh cranberries. It had deep earthy tones with plenty of fruits. This Cranberry & Port sauce would be the perfect accompaniment to your Christmas Turkey and it tasted as good as home made ones. Add a couple of spoonful to your braised red spiced cabbage or even to your gravy. Your Christmas ham wouldn’t have the wow factor without the glaze, so if time is short and you don’t want to compromise on taste and flavour, this is the one. It was a perfect glaze to a lion of Bacon too, with deep amber tones and caramelised edges. The lion of bacon is a perfect shape for easy carving and makes a nice change from the traditional ham. Again a must have store cupboard staple. For perfect crisp golden roasted potatoes, Parboil, drain , shake and drizzle over with duck fat & coarse sea salt. Roast in a pre heated oven until golden brown. I loved the texture.With visible mustard seeds, like popping candy, it exploded on the palate in small burst of tangyness & sweetness. Ideal as a rub, in a marinade, spread or in any salad dressings. Again great texture, but the stout gave it a more robust flavour with sweet to spicy undertones. The sweet aroma of acacia is evident in this pale golden honey. It had a mild sweet floral flavour. Acacia honey doesn’t tend to crystallize hence this liquid gold will mix easily in any liquids either for your salad dressings, marinades or cocktails. More like a biscuits or cracker, these oatcakes were far from being rough or coarse. It had a quite refined texture and both were delicately flavoured accordingly. Perfect to serve as a base for your hors d’oeuvres, a Cheese board or simply to nibble on. Heavenly biscuits. Crumbly , slightly spicy and chewy in texture. So Irresistible that I kept going back for more and they vanished in seconds. These fun bites shortbread were buttery and bursting with fruit pieces and tasted similar to a strawberry cheesecake but in cookie form. What’s not to love !!!. Very sad to see the box empty. While it tasted good, the portion size was far too small to be value for money. Smooth milk chocolate but the alcohol content was far too subtle . It was hardly there and came only slightly as an after taste. Very crisp cookie shells, gooey centres and not overtly sweet. With some edible metalic paints & edible powder dust, get the kids busy and transform these into edible tree decorations. A clear winner, this good looking dessert had all the layers and aspects of the real deal. Lady’s fingers biscuits were delicately flavoured with coffee and marsala wine, with light Whipped Mascarpone cream. Heavenly. Very dainty and stylishly presented in their own individual cups, they would be ideal for any party or your New Year’s eve buffet. The pannacotta was silky and very smooth with a nice topping of raspberry compote with real chunks of fruits present. While a nice crumbly base, this rich, creamy and zingy lemon Cheesecake was bountiful with lemon zests with a topping of lemon citrus jelly. This fabulous dessert was a firm favourite. With a crumbly, flaky pastry base, cooked vanilla clotted cream and topped with sliced strawberries and a strawberry glaze coulis. It was light , creamy and delicious. With plenty of fruits, it was a real treat , in so much as you could easily pass it on as home made. A clear winner. Not far behind, these roulades were equally delicious and for those of us where the traditional pud always seems far too heavy on Christmas day, these meringue roulades would make a suitably festive replacement. They defrosted perfectly and were not in the least soggy. The meringue was still crisp. Lightly whipped cream with lots of fruits and tangy raspberry sauce. While the toffee pecan roulade was studded with toasted chopped pecan nuts and a yummy sticky toffee sauce. They would be equally good half thawed , sliced and served with some custard. These bite size ice cream desserts were tasty and perfect in satisfying a sugar rush but were nothing more that that. A delicious cake, Smooth, creamy and velvety with a lovely biscuit base. The proportions of chocolate to cream was spot on, making this cake very light and not overly sweet. Garnish with some raspberries and a sprinkle of edible gold dust, this cake is sure to impress any guests. 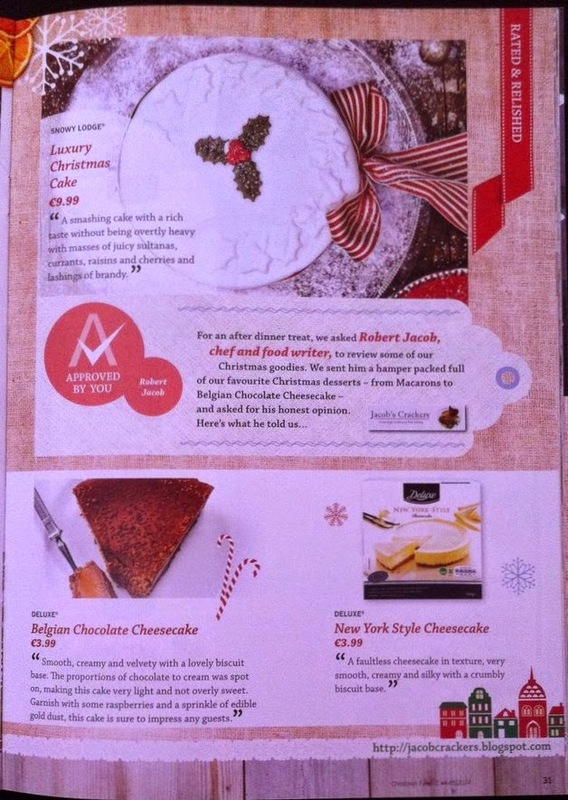 The celebration would not be complete without a festive – looking Christmas cake for the centre piece. A smashing cake with a rich taste without being overtly heavy with masses of juicy sultanas, currants, raisins and cherries and lashings of brandy. While it had a generous amount of fruits , the texture was rather dry and crumbly and the lack of any kind of alcohol in this cake was evident in it’s maturity. The marzipan and icing was also too rock solid for my taste. A little too sticky in texture , it was however very flavoursome with lots of fruits with a good dark colour. Disclaimer : I was not paid to review these products. All views are my own and according to my taste buds.